Automotive industries develop so fast in Indonesia. Besides its quantity that keeps growing, many new brands of cars and other motor vehicles also appear. This fact brings about some new businesses related to it. Auto-repair-shop businesses, car-wash and auto-salon businesses and car-accessories businesses keep growing and always have their customers. The increasing quantity of cars and other motor vehicles nowadays has also increased the business opportunities such as auto-repair-shop businesses, car-wash and auto-salon businesses and other automotive businesses. Thus, this opportunity must be used properly because they are so prospective and are long-term businesses. MACSAUTO, which is a Franchise-based Company, has integrated these prospective businesses. 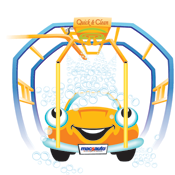 We have our focus on motor vehicle’s treatments such as Rainbow Express Car Wash, Detailing Car Wash, Car Waxing, Car Body Gloss, Auto Detailing Salon (Interior, Exterior, Engine Detailing), Paint Protection, Rust Protection, Spooring Balancing, Oil Service, Accessories, and Interior Car Leather. Our VISION : Become the most trusted car care Franchise in Indonesia. Our MISSION : To create a professional business which is built upon the spirit to go forward and grow together, and to give maximal services which are full of integrity and professional until there comes a business satisfaction from us as the Franchisor, also the Franchisees, and the customers who have trusted the development of their businesses to us.